In today’s competitive business climate, supply chain management professionals are looking for ways to reduce costs, assure and improve the quality of the final product, and achieve a faster time to market. Strategic sourcing is one method that procurement managers can use to help achieve these supply chain goals. A sound strategic sourcing strategy can create opportunities for your company to improve corporate image, increase sales and market share, and reduce costs. The healthcare industry is no stranger to issues when it comes to strategic sourcing and supply chain management issues. Chief among them is a lack of transparency. How do you find the best possible equipment from trusted clinicians at the best price? In 2012, Dallas-based startup BroadJump, LLC was conceived to solve a critical issue facing healthcare organizations – lack of insight into, and control of, their non-labor expense categories. They recognized that the lack of pricing transparency and procedure data that plagues the industry has resulted in hospitals and other medical facilities overpaying for supplies. In addition, opportunities to increase procedure standardization and efficiency have gone undetected, which negatively impacts both profitability and quality of care. BroadJump had an ambitious goal of streamlining the medical sourcing process for hospitals by providing pricing transparency across the medical supplies and equipment industry. They needed a custom software solution that could help them track and consolidate different prices for hospital equipment and supplies across the nation - and they needed it fast. Let’s dive a bit deeper into the issue that is causing such a headache for the healthcare industry and how Code Authority fulfilled BroadJump’s need for a solution that matched their business plans. The primary objective of any organization’s sourcing and procurement department is to maintain a continuous supply of goods and services which supports the operational needs of the organization. Establishing key criteria and protocols for the supply chain network ensures success and minimizes barriers, challenges, and pitfalls. Healthcare supply chain management or procurement involves obtaining resources, managing supplies, and delivering goods and services to providers and patients. To complete the process, physical goods and information about medical products and services usually go through a number of independent stakeholders, including manufacturers, insurance companies, hospitals, providers, group purchasing organizations, and several regulatory agencies. At the core of this is a need for accurate data for reporting and predictive analytics so that leaders can make informed, quality decisions. By promoting efficiency in the healthcare supply chain, hospitals and physician practices can create substantial cost-reducing opportunities across their organizations. Healthcare supply chain management is unique because each stakeholder has their own interests to protect. Different stages in the supply chain flow may be focused on their own goal. Providers may want to use a specific product because they were trained with it, whereas hospital executives aim to purchase the most affordable quality items. Some healthcare organizations have found success with supply chain management through cost transparency. The process of harnessing price and utilization data allows healthcare organizations to track and manage inventory more efficiently and establish better informed purchasing contracts with manufacturers. In today’s era of value-based care, healthcare organizations are focused on reducing redundancies and eliminating waste, but providers also need to work together to effectively reduce costs and boost performance. Effective procurement managers consistently locate the best quality materials at the lowest possible cost from the most reliable suppliers, keeping track of logistical considerations that may make one trade partner more beneficial at certain times of the year or under certain external conditions. Developing solid relationships can help sourcing professionals become better at meeting cost, speed-to-market, and quality goals while allowing suppliers to more efficiently tailor and deliver materials to precise purchaser specifications. Strategic sourcing is in constant development. Keeping your knowledge in this field up-to-date will help administrators understand, plan, and implement an effective and efficient strategic sourcing strategy while reducing overall costs. 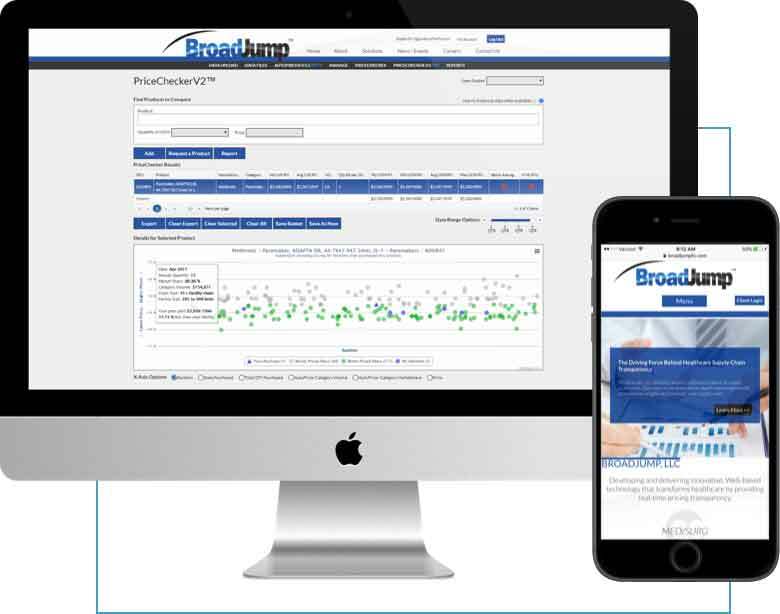 When BroadJump came to Code Authority, they explained that the medical supplies industry can be quite murky when it comes to pricing and they wanted to make that pricing crystal-clear. “Out of frustration with the status quo, we reached out to Code Authority to develop a suite of applications that not only help medical providers gauge their pricing against the market and manage their costs on-demand, but also positively impact discussions with clinicians to pinpoint best practices in procedure protocols and reduce variance in supply costs” said Greg Corban, COO of BroadJump. Through an extensive design and architecture phase, Code Authority made sure to capture all the requirements of this one-of-a-kind product that needed to be fast-tracked to meet BroadJump’s ambitious business plan. The solution was to provide BroadJump with a 100% cloud-based solution to meet their every need in a fast and secure fashion. Code Authority developed a program that featured an efficient way to analyze purchase data across the medical supply chain in order to provide price comparisons. They used cloud platforms like Microsoft Azure to deal with big data while minimizing the cost. It was also important that Code Authority implemented speed and efficiency into the program that could adapt as the industry changed or a certain medical facility's needs changed. This was achieved by using hybrid architectures, combining many technologies and products such as: Docker, Kubernetes, cloud services, as well as relational and document databases. Code Authority demonstrated a mastery of different platforms for BroadJump’s specific needs and had them working together for one seamless solution. Due in part to their contributions to the healthcare industry, BroadJump was selected by Modern Healthcare as one of the Best Places to Work in Healthcare in 2016 and 2017 and was ranked #1 in the 2017 Fast Tech 50. They’ve seen revenue growth of an astounding 7,750%! Code Authority matched BroadJump’s pace, helping them grow into one of the most renowned medical companies in the nation. There’s a long list of benefits to working in the cloud, enabling your business to be faster, more scalable, and safer while also being both more efficient and less expensive. Those benefits are changing the way applications are created and brought to market. With a 100% in-house team of cloud developers and AWS certified architects, Code Authority will design, build, test, and deploy your cloud-based project. Want to learn more about the full roster of services Code Authority provides? Visit www.codeauthority.com or contact us today for a free estimate of your next project.